A letter sent recently by HSBC Bank Malta plc to a number of its customers informing them of a further reduction in interest rates on savings accounts shocked many people. HSBC announced that with effect from 1 December 2015, interest on savings accounts will decline to 0.02% per annum for amounts between €5,000 and €500,000. Effectively, no interest will be earned for balances below €5,000 and above €500,000. Previously, interest of 0.05% was earned for amounts up to €25,000 and interest of 0.10% per annum for balances in excess of €25,000. Many savers, especially pensioners, who are already struggling to generate sufficient income from their accumulated life savings to supplement their pension income, will be hard hit by this latest measure. However, it is not only HSBC Malta that is offering measly interest on savings accounts. Bank of Valletta plc also reduced its interest rates on savings accounts to 0.05% per annum a few weeks ago. Interest rates on term deposits have also declined rapidly over recent years and an investor will only manage to obtain a maximum of 2% on a 5-year fixed deposit with the larger local commercial banks. The financial statements of the retail banks indicate that, rightly so, many investors are not willing to place their funds on a term deposit for a longish period of time given the low rates of interest on offer. Most customer deposits are now either on call or fixed for a short term with rates of interest ranging from a low of 0.6% to a high of 1.1% for a 1-year deposit. Bank customers are maintaining this flexibility so as to be in a position to go for alternative investment opportunities paying higher rates of interest (when available) to help sustain their living standards. The current interest rate environment is even more distressing for the elderly who had experienced double-digit interest rates overseas in the 1970’s and 1980’s. Many pensioners in fact question the reasons for the decline in interest rates by the commercial banks. 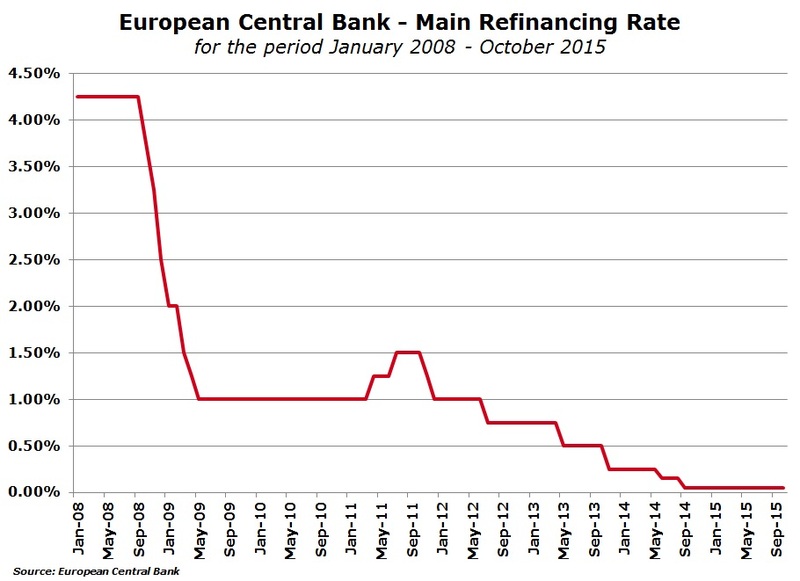 Official interest rates at the European Central Bank declined rapidly in late 2008 following the start of the international financial crisis. Rates dropped from 4.25% to 1% in line with the movements of other major central banks and after a brief upturn to 1.50% in 2011, interest rates declined to a mere 0.05% with effect from September 2014 on fears of deflation across the eurozone. Meanwhile, the rate on the deposit facility, which banks use to place overnight deposits with the Eurosystem, turned negative for the first time in June 2014 and dropped again to -0.20% in September 2014. In effect, this implies that banks actually pay interest to the ECB to place some of their excess liquidity! This measure was implemented by the ECB to instigate banks to lend their money to corporate customers and individuals thereby assisting an economic recovery to take place. Concurrently with the decline in interest rates, Maltese banks have continued to experience a steady inflow of deposits. By way of example during the twelve months ended 30 September 2014, customer deposits at Bank of Valletta plc increased by €900 million (14.5%) to €7.1 billion and this continued during the first six months of their 2014/15 financial year with a rise of a further €680 million to €7.78 billion. Likewise, HSBC Bank Malta plc experienced a €350 million increase in customer deposits during 2014 and a growth of a further €331 million during the first half of 2015 to just below €5.2 billion. Unfortunately this strong rate of growth in the deposit base was not matched by a corresponding increase in loans to customers. In fact, the advances to deposits ratios of all local banks have been on a steady decline in recent years reflecting the higher level of liquidity within the local financial system. The advances to deposits ratio of Bank of Valletta plc dropped to 51.2% in March 2015 while that of HSBC Bank Malta plc was 62.5% in June 2015. A few months ago, HSBC Malta’s outgoing CEO indicated that this excess liquidity is hurting the bank and the aim of HSBC Malta is to increase their advances to deposits ratio to 80%. Meanwhile, many banks across the eurozone continue to maintain significantly higher advances to deposits ratios. In effect, the excess deposits being placed in the local banks which are not being loaned out to customers are either invested in fixed-interest rate securities across the local and international financial markets or else placed with the ECB at a negative rate of interest. As such, it is important for many savers to understand that their savings at the bank currently represent a cost to the banks. As a result, the decline in interest rates on term deposits as well as on savings accounts is a measure to protect the profitability at the banks and also to deter customers from placing further deposits. This must also be seen in the light of the significant increase in regulatory costs being incurred by the banks as well as the requirement to maintain additional capital which is also negatively impacting the return on equity, a key measure for shareholder returns. Against the backdrop of the historically low interest rate environment, it should therefore not be suprising that the bond issue of Hili Properties plc was so heavily oversubscribed. While no official information is as yet available on the total amount of funds raised and the number of applicants, this was the first bond issue in many months open to the general public at large. The other bond issues earlier this year of International Hotel Investments plc, Mediterranean Investments Holding plc and 6pm Holdings plc were all targeted at existing bondholders or shareholders of the respective companies. On the other hand, last week’s two new MGS issues were met with tepid demand from retail investors indicating their aversion to very low rates and prices above par value. Statistics published by the Treasury show that applications by retail investors for the long-term MGS (the 2.3% MGS 2029 at a fixed price of 102.50%) amounted to €88.2 million (nominal) across 3,514 applicants. This is substantially below the record amount subscribed for earlier this year. In February 2015, applications amounting to over €440 million were lodged for the 3% MGS 2040 at 100% by more than 11,000 investors. With official interest rates at the ECB and also across many local and international banks likely to remain at very low levels for an extended period of time (possibly years), corporate bonds offering an attractive risk/reward return are therefore likely to continue to be in very strong demand. In view of this, the Malta Stock Exchange and all market participants should collectively work towards attracting many more companies to offer debt securities or equity instruments to a growing investor population seeking a more reasonable rate of return on their accumulated savings. If there are too few bonds or income-generating investment opportunities being issued, the risk of capital flight becomes real since investors will run out of patience and seek alternative investment opportunities across international markets to achieve a desired level of income possibly also into securities rated below investment grade. Several new local bond issues need to be launched to satisfy part of the significant demand arising from the increasing amount of investors seeking the bond market as an alternative to bank deposits. These are truly challenging times for many investors.